sailing into Nafplion 3/24/07 Saturday Leonard and Kerstin Trawick were up to see the dawn rise over one of the Greek islands. Then we’re off to see Nafplion and Mycenae. Nafplion is very well fortified dating back to the Bronze age. It was the capital of Greece after Greece won its liberation from the Turks. The capital moved to Athens in 1884 when the other nations gave Greece a King. 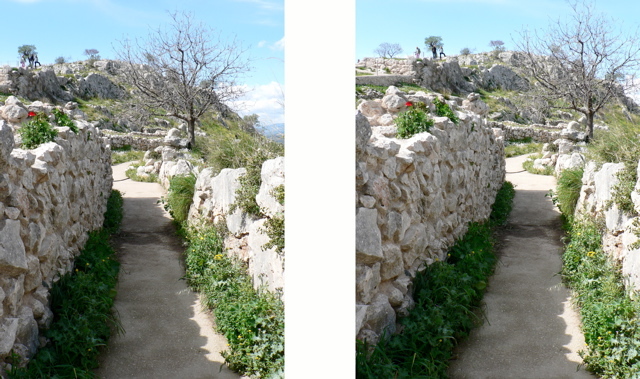 Most of the fortifications date from the 15th-17th c BC. The earliest evidence of sea-faring is found in a cave in Argolis. Heinrich Schleiman called this area Mycenae. In the Byzantine era Mycenae hade many beautiful churches which the Crusaders had built around the 13th c AD. 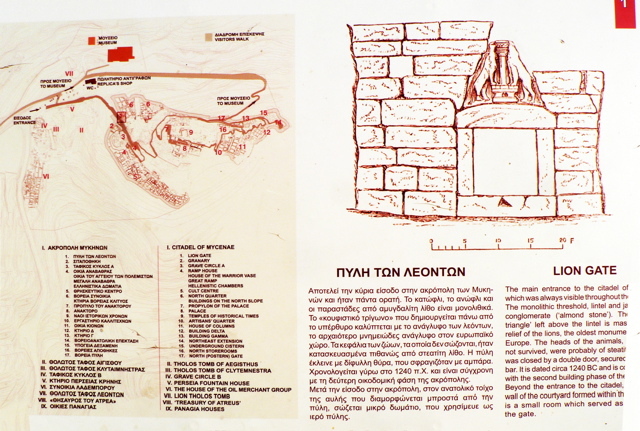 Mycenae was the home of Agamemnon. Argolis is very fertile, and is a favorite spot of Hera. Heracles was born here. Heracles became King of Tyrins. The neighboring King of Mycenae required Heracles to perform certain feats. The mountains that we can see with snow on them are the Arcadia, mountains of the Peloponese. Troy is in today’s Turkey, at the entrance to the Dardenelles. People from Mycenae have been sailing since about 9000 BC. There was a great demand for metals, which the Mycenaen ships would carry to other states. It was important to have access to the Black Sea, where many of the metals were mined. That may have been the real reason for the siege of Troy. The story is that King Agamamnon of Mycenae gathered his ships at Aulis, but there was no wind. The priests said that he had to sacrifice Iphiginea, the youngest of his daughters, in order to propitiate the winds. In the 13th c BC Agamemnon laid siege to Troy for 10 years, and finally won (although there is some doubt about the ruse of a large empty wooden ox bearing troops). Agamemnon returned from Troy and was asassinated by his wife Clytemnestra and her lover. The daughter of Agamemnon and Clytemnestra, Elektra, convinced her brother Orestes to kill their mother and her lover. In 1874 Henry Schleimann discovered the ancient citadel of Mycenae, which stands on a low hill wedged between the lofty peak of Mounts Zara and Profitis Ilias. From here, in the palace which crowns the hill, Agamemnon and his descendants were rulers of all they surveyed. They controlled an empire of mini-states in the Argolid of which Argos and Tiryns were the most important in the Peloponnese. The Mycenaeans were an Indo-European people who began to arrive in Greece around 2,100 BC. By around 1,600 BC they had created a world of small, sophisticated Bronze Age settlements centered around large palaces which were ringed by crude but imposing walls of massive stone blocks. The best known of these is Mycenae itself, but there are other palace sites at Tiryns and Pylos. After the fall of Minoan civilization in Crete, the Mycenaeans became the main power in the region. Many inscriptions in Linear B, the earliest known Greek writing, have been found at Knossos (on Crete) as well as on the Greek mainland. The Mycenaean civilization crumbled quite suddenly around 1,200 BC, for unknown reasons. This was followed by a Dark Age which lasted almost two centuries. Excavations show several generations of squatters using the sites of the Mycenaean palaces during that time, before the iron-using Dorians — speaking another dialect of Greek — began to trickle in and settle much of the Greek world around 1,050 BC. By the time they settled in the former Mycenaean heartlands. Mycenae and its kings were shadowy legends, and it came to be believed that the massive walls of their palaces had been built not by men but by the one-eyed giant called Cyclops. The citadel can be entered from the north-west through the Lions Gate. The relief triangle above the joist carries the oldest example of monumental sculpture. Two lions, whose heads stand facing each other, their paws resting on a high pedestal representing an altar above which stands a pillar ending in a uniquely shaped capital and abacus. The gate was closed by a double wooden door sheathed in bronze. After passing through the Lions Gate one can see the six royal graves, encircled by a row of stone slabs placed upright in the ground. The dead were buried with a selection of personal belongings such as gold face masks, gold cups, jewelry, bronze swords and daggers with gold inlay decoration. 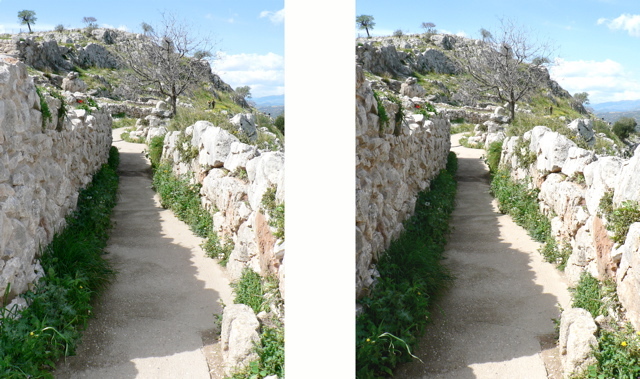 The cobbled ramp outside the grave area leads to the palace and the upper part of the citadel. A short distance away from the main site is the treasury of Atreus, often referred to as the Tomb of Agamemnon. The tomb is beehive shaped with a smaller inner chamber. tomb of Atreus, Agamemnon's father? From myths we know that the Kings of this period were blood related, and didn’t fight each other, but all their towns were heavily fortified, perhaps just to show their strength. Mycenaeans traded all over the world and were expert architects. 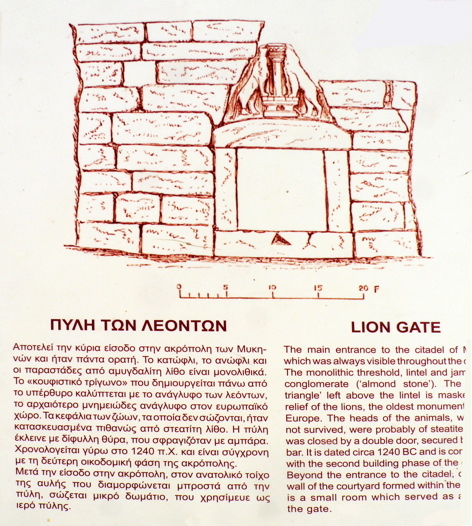 One entrance to Mycenae is the Lions Gate. Facing the door, we have a long wall on the left and a square tower. Mycenaeans were the first to make post and lintel formations to spread the weight of the wall across the doorway. Schleimann attributed this tomb to Atreus, the father of Agamemnon, and dated it as around 1250 BC. It had a beehive shape of huge stones, and when finished, was buried with earth to make it look like a hill. Because of the heavy weight, they used a triangle design to hold up the lintel. The triange was covered with red stone, with half-pillars in green stone on either side. The red and green stones are now in the British Museum. When Schleimann came, in 1875 AD, shepherds were using the tomb, and travelers would live there, and left smoke from their fires. 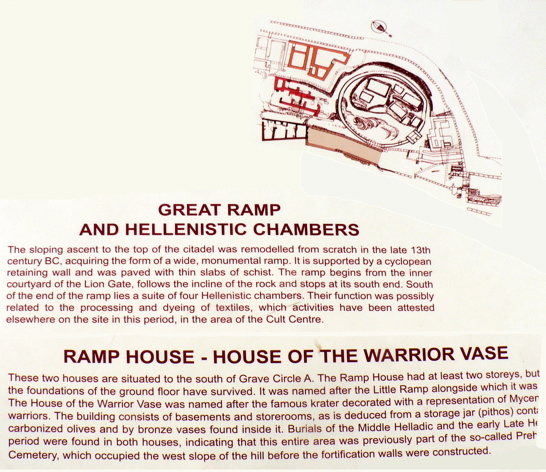 Nafplion has fortresses in the upper hill and lower hill, connected by a stair in a tunnel. It was also protected by the fort in the harbor. the tomb of Atreus, Agamemnon's father? We had a super lunch on board our ship. Wonderful Greek salads and a super spinach and rice dish. After lunch we drove east from Nafplios to Epidouros, which is drier and full of olive trees. There isn’t enough water for orange trees. There is a fortress from the 3rd c BC which guarded the route to the tomb of Aesclepius, son of Apollo, who is credited starting the first hospitals. The story is that Apollo performed a Caesarian on a woman who was dying, and raised her son as his own, and had him trained by Chiron, a surgeon in his own right, from whom he learned all about herbs and surgical techniques. He set up a series of residences where knowledge of medicine could accumulate and where the sick could come to be cured. Those residences were called Aesclepius, after their founder. Hippocrates worked in the Aesclepius of Knossos. Æsclepius (also spelt: Asclepios, Æsclepius, Æsculapius, Æsclepius) was a healer, his mythical roots going back in to the second millennium BC, he became a demi-god. Over time he evolved into a temple god in his own right. The temples in his honor were temples of healing dreams. His daughters were Hygea (on the preventive side of medicine) and Panacea (on the drug side of medicine). A Klínè was a sacred place or a sacred skin set out around the temple, where the sick person reclined to enter the dream state. From these names we have derived the words, Panacea, Hygiene and Clinic. At the height of the cults power, there were 420 temples, spread across the ancient Greek empire. The Aesclepiae were devoted to diet, exercise, study, and spa bathing. In the days of Hippocrates the Aesclepiae performed no operations except childbirth and simple orthopedics. They might also remove little surface tumors or thrombosis relief. After the death of Alexander the Great, the Aesclepiae could dissect bodies and perform operations. They then found out how body muscles and bones worked. They did not learn about the blood circulation. In Western Europe medical care stops with the fall of the Roman Empire, and doesn’t revive until the 8th c AD when the Arabs attack Spain. The Knights of St. John took up the practice of medicine. In Greece the practice of medicine continued throughout because there was still a central authority. In the 3rd c AD, Goths completely destroyed the sanctuary at Nafplion. The only building remaining was the theatre of. Epidauros. Every 3-4 years the theatre of Epidauros would have a festival with athletic, singing, and poetry contests. In the 6th c BC a priest named Thespis detached one person from the chorus to be an actor. Aeschallus detached a second actor from the chorus. Long ago, the chorus and actors would perform on a threshing floor with the hillside rising around them where the viewers would sit. This developed into the theatre. The Theatre of Epidauros was well-known for its acoustics. The curve of the seats helps the echo effect. Wooden masks helped amplify the sound. All theatres face the sea, so they get the breeze which also helps the acoustics. The theatre of Epidaurus has 3 acoustic centers where the actors would stand so they could be heard throughout. The theatre holds 14,000 people. On request, Martha stood at one of the centers and gave some speeches from Arsenic and Old Lace. The Ancient theatre of Epidaurus belonged to the sanctuary of Asclepios, the God of healing. In his honor, sanctuaries, known as Asclepieia, were founded throughout Greece and parts of Turkey. This sanctuary prospered in the 4th c BC and continued to function with one or two interruptions until the 4th c AD, when, along with other shrines in Greece, it was closed by decree of the Emperor Theodosius. The severe earthquakes of 522 and 551 AD completed its ruin. 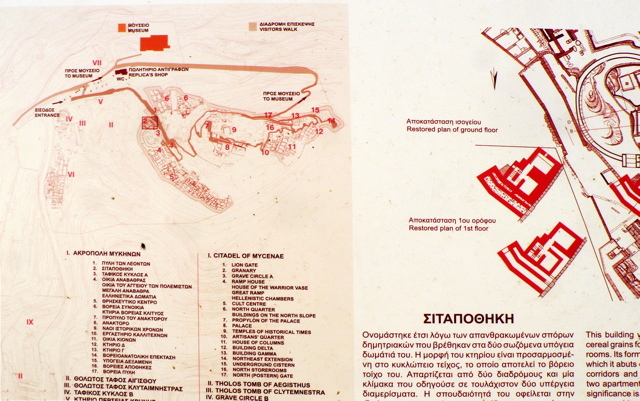 Excavation began in 1879 under the direction of P. Kavadias and was completed in 1951 by the French School of Archeeology. On the slopes of Mt. Kynortion lies one of the best known and best preserved of all ancient theatres, where performances are still given in the summer. Its superb acoustics reveal that the ancients knew well how to make the most of the morphology of a site when building a theatre. It was built in the early 3rd c BC by Polycleitus the Younger. In its original design, there was a circular orchestra, the only one to have survived unaltered from antiquity. At the center stood an altar. The seating capacity at that time was 6,200. In the 2nd c BC alterations were made to double the capacity by accommodating a further 6,100 spectators. The front seats were reserved for people of importance, and hence not just benches, but were fashioned into throne-like seats. In the main area there were two rooms on either side of the theatre with a row of small Ionian columns marking the outer edge of the facade. Each passage way was adorned by a stately monumental gate, adding allure to the whole structure. To the north lies the sanctuary where only some remains are to be found. The sanctuary consisted of a gymnasium, bath house, palaestra, stoas, library, temples to various gods and goddesses of which the most important was the temple of Asclepios. An inscription of 380 BC informs us that it was of Doric style with 26 columns. The cella housed the statue of Asclepios. It was decorated in gold and ivory and represented the God seated on a throne, one hand clasping a staff, the other resting on the head of a serpent, and a dog at his feet. Near to the temple stood the Tholos — the Round House of Pausanias. Again, this was the work of Polycleitos the Younger. This circular building had an exterior colonnade of 26 Doric style columns and another interior colonnade of 14 Corinthian columns whose capitals are considered amongst the most beautiful. A richly ornamented door opened into a cellar, whose walls and ceiling were paneled in marble and decorated with sculptured blossoms. Below the cellar was a crypt. The purpose of the Tholos, however, remains obscure. It has been interpreted as a center for the practice of secret rites, a chapter house for priests, or a snake pit. The snake sheds its skin once a year thus renewing and revitalizing its body. Working on this theme, patients entered the sanctuary to cleanse their minds and bodies in a healing process. The sick, hoping for a cure, believed that the appropriate treatment would be revealed to them through dreams or by some other divine act. They would sleep in the Abaton or Enkoimetrion, a colonnade about 70 meters long. The dying were not allowed in, because if they should die within the sanctuary it would ruin the reputation of the God Asclepios. The majority of the patients had psychological disorders. The sanctuary kept the minds occupied through entertainment. The Gymnasium was not just for physical activities, but also included hours of meditation. There was a library for reading and studying. The baths contained relaxing and soothing mineral extracts. The theatre gave performances which were held during the day until sundown, so at the end of the patients’ day they would return to their sleeping quarters quite exhausted but mentally much healthier.